Get our DOCX file repair software to fix the annoying error message "The document 'Filename' caused a serious error the last time it was opened. Would you like to continue opening it?". This warning message symbolizing DOCX file corruption, restricting data accessibility pop up on screen due to the Word document being disabled from the list of MS Office program. The error arises when you try to open two Word instances at the same time and in this process, Word crashes. 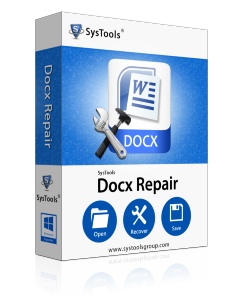 Our DOCX Repair Tool is an intellectual development that enables users to retrieve Word 2007, 2010, 2013 and 2016 data from the corrupt state. With our effectual solution for DOCX file repair, users are proffered with the finest set up to work around major and minor corruption issues and to fix error messages. This software is built-up with excellent DOCX file fixing abilities that perfectly handles problems that crop up due to factors like template corruption, fast file saving, system shutdown while working or saving the file, complex nested tables, virus attack etc. The software for DOCX repair provides two options for saving recovered file. One, you can save data as a DOCX file format or you can save as RTF file format. The software lets you view the recovery status while the software retrieves the data from DOCX file. The software prominently extracts text data from the Word 2007/2010/2013/2016 file with no harm done to it. Unlimited Word file recovery is possible with our technical-driven DOCX repair software. Surely, after reading all the attributes of the software, must be having the urge to analyze the software. Understanding your need, we provide free trial version of our DOCX file repair tool that allows previewing recovered Word file items.